It’s early in the new year which means that it’s time to focus on goals for 2017. It has been a while since I’ve posted annual financial goals, but my financial freedom goal has re-ignited my motivation. It’s no surprise that I’m a fan of setting goals, a big one being the million dollar net worth goal that I set back in 2006 and achieved in 2014. I believe that setting these goals provided direction and motivation over the years that resulted in hitting major our financial milestones. Since hitting that net worth goal, my focus has shifted from net worth growth to a goal of building enough passive income to cover our recurring expenses. In the last financial freedom update, I reported that we currently generate close to $24k/year in investment dividends, my main focus for this year is growing my dividend income stream. The SMART goal system is similar to my philosophy of making baby steps towards a larger goal where it creates a systematic method of achieving even the largest of goals. Having summarized the system that I use, here are my financial (and related) goals for 2017. 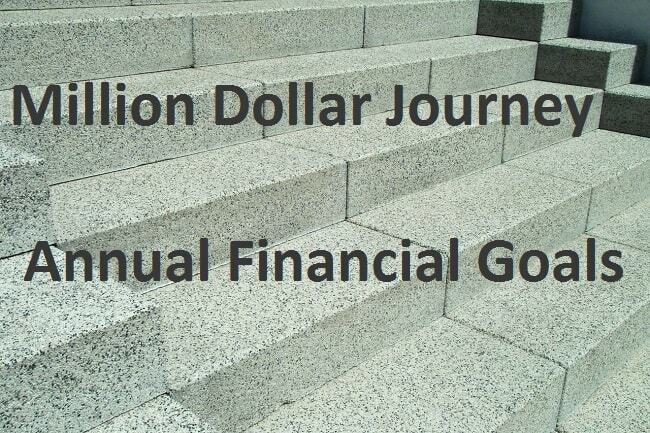 This goal is something I have every year to push me to get those contributions deposited. For this year, I’m looking to maximize both TFSA‘s ($11k), the RESPs ($5k), and our RRSP‘s (varies). Our RRSP contribution amount is relatively small since I work with government which means I contribute to a defined benefit pension (which reduces my RRSP contribution room). I’m happy to report that we have already maxed out both TFSAs and RESPs – both of which were completed earlier this month. In order to reach $60,000 in passive income in milestone in 4 years time, I need to remain aggressive in saving and deploying capital. By the end of this year, my goal is to reach $35,000 in dividend income from the current amount of approximately $25,000. This will be a 40% increase year over year which is very aggressive but necessary to reach my long term goal. One goal I had in the past was to simply our portfolios with some ETFs. We have since achieved this with Mrs. FT’s RRSP where it is now 100% indexed (along with the family RESP). This year, I hope to simplify our dividend portfolios by trimming positions that have cut or reduced their dividends. I plan to hold only the best names in our dividend portfolios. Although I have a fairly extensive finance related book collection, sit-down time with a good book has decreased significantly over the years. I could use the excuse of having two young children who have more activities that I would like to admit, but in reality, reading (besides online articles) has fallen off the priority list. For this year, I’d like to finish at least 6 new finance related (or other) books, and maybe grow a few brain neurons in the process. From the beginning of MDJ we’ve made supporting local charities a priority. We make an automatic monthly donation to a local children’s hospital and monthly donation to a child in Guatemala through the Compassion Canada charity. Our charitable donations have been flat (and even decreased a little) over the last few years, mostly because our incomes have been volatile, but I’d like to continue the trend of growing our charitable contributions. For 2017, I plan to donate at least $2,500 to registered charities. With the SMART philosophy in mind, what are your financial goals for 2017? FT and Chris, which ETF do you currently invest in? I am trying to employ similar strategy in terms of generating passive income from my investments and just trying to get an idea of which ETF to choose. @ Jeff, I use a simple couch potato strategy despite a healthy seven figure portfolio. Check out http://canadiancouchpotato.com/ and he has recently updated his recommended funds for 2017. A 3 fund ETF portfolio using Vanguard, iShares, etc. would be great if your portfolio is at least six figures. Less than that and you could use TD e-series funds. Couch potato has been very low stress and low cost for me while giving decent returns (8.1% overall in 2016). You won’t try to beat the markets, you ARE the markets. +1 to this – I also highly recommend Dan’s blog (canadian couch potato) as a reference for the top ETFs in Canada. Personally, I like XAW which covers US and international. XAW + XIC and you have global diversification. Then throw in a bond fund for a simple indexed portfolio. 2) Contribute to both RSPs – I put my bonus in and have a work contribution plan, so I normally come close to maxing out or have some extra past room to use. We need to start contributing to my husband’s again. Overall we are in good shape, but I like having goals to keep up focused. We also make monthly charitable donations and I would like to donate my time this year. 1. Save 60% of my after-tax income. This is a percentage as I have a variable income stream and find it’s easier to use that instead of dollar values. I really like that you set a giving goal. Nothing feels more like a win than knocking that goal out of the park. I own 5 rental properties, the 1% rule is pretty impossible to achieve. I buy in one of the most affordable Ontario markets and they still don’t come that close to the 1% rule. However they are all cash positive properties. Beyond the 8% rule I would suggest reviewing all expenses before purchasing anything. Sometimes certain properties have oddly high taxes or fees which can really effect profitability. The rental property business is a lucrative one, but be diligent in your review of the property as it can make or break it. Thanks so much for all the info Mike! Your 8% rule is much less daunting than the 1% rule. I’ve been having a tough time taking the more American based guidelines and applying them to Canadian rentals. Cash flow positive is the goal, and as an Alberta based buyer looking in Ontario I understand there are a lot of extra expenses to consider. FT, I’d be interested in learning a bit more about your strategy to increase your passive income by $10k. If you were to invest new money into the market you could probably chase some pretty solid companies or ETF’s that have a 3-4% dividend. With those returns, you would need to invest ~$250k to hit the $10k mark. What other avenues are you looking at – private equity, rental property, etc? Hi KF, right now, i’m hoping to make the gains via dividends only. The plan is to invest new savings, existing savings/cash, dividends received, dividend increases, and selling positions that have a low dividend to reinvest in higher yields. Those are some ambitious goals FT. If your net worth is roughly $1 million, you can easily reach $30K in annual dividend income. get a combination of dividend increases, dividend reinvestment and putting new money to work to get there. I wish you good luck in achieving those goals. Great goals! $25K in dividends is awesome. Good luck on raising those to $35K and then eventually to $65K. Also, we like that you’re slowly moving into indexed funds, as our portfolio grows and we are closer to retirement, I would like to move the bulk of our dividends stocks portfolio into indexed funds as well. Great job of maximizing the TFSA and RESP contributions so early. I like to max those two contributions early too, but sometimes finding that much cash so early in the year needs a bit of work. Kudos to you for being so disciplined. You are setting a great example for others to follow.